The 2010 Ford Transit Connect; It's compact, utilitarian, can be outfitted with awesome goodies, boasts 135 cubic feet of cargo space, gets one proven power train and starts at $21,475. What's not to love? We knew the 2010 Ford Transit Connect was coming, and to be perfectly honest, it's refreshing to see a no-nonsense, utilitarian product bringing some much needed honesty into the market. The Transit Connect is entering a US market completely barren of compact commercial vehicles but it should also be considered a global refresh so just what has Ford done with the 2010 Transit Connect? The new Transit Connect gets an updated face based on Ford's European Kinetic Design language, which is shared to some extent with the new 2010 Ford Taurus. The trapezoidal upper and lower grilles meet in the middle and the upper is flanked by a new set of headlight clusters, it also gets a newly profiled hood to tie everything together up front. The rest of the body is largely unchanged, aside from reshaped rearview mirrors and the inclusion of backup radar sensors on the rear bumper. If you're hoping to see a long options list in the power train department from the outset, you're going to be disappointed. To keep things simple, Ford is offering a well tested and reliable Duratec 2.0 liter four cylinder with 138 HP running with a 4 speed automatic which is projected to return 20 MPG city and 24 MPG highway. Ford has said it would consider a manual transmission, should there be sufficient demand, but from the start it's auto only. If you're willing to wait a bit, the Transit Connect will be available in the second half of 2010 with two all-electric versions, outfitted by EV experts Smith Electric Vehicles. Complete details on the Transit Connect BEV can be read here. From an engineering perspective, the Transit Connect has been designed to meet the durability requirements set down for US full-sized trucks, so it would be fair to call it "Built Ford Tough," an odd notion for a funny-shaped, car-based minivan. Considering the punishment these little buggers are likely to see at the hands of commercial users and little kids alike, it's probably a good thing they're designed to take it. Inside, the new Transit Connect gets a dash which has been rethought without losing its simple and sturdy feel. The center stack goes from vertical to angled away from the driver, making sight lines considerably better than the outgoing model, the vents have been swapped for a simpler round style popular these days. The base model gets an AM-FM radio, upgradeable to include a CD player, but this being a commercial vehicle, there's an optional Ford Work Solutions in-dash computer system which integrates very nicely into the dash, taking advantages of a reshaped dash-top storage slot that accommodates the system keyboard. Also optional with the Work Solutions pack is a pair of Tool Link sensors which make keeping track of your stuff as easy as pasting on RFID tags, whether for a hammer or a stroller. And that gets us to an interesting point, the Transit Connect is currently aimed primarily at the commercial market, but it can be outfitted with a split, forward-folding bench seat in the back, more installed glass, painted fenders, chrome grille, and fog lamps which make it, at least in our eyes, an intriguing choice for folks interested in substance over style. With 135 cubic feet of cargo room, a rugged rubberized load floor with a 1600 lb payload capacity, and bombproof interior components, we're wondering if this thing turns out to be the best mixed-use vehicle ever offered on US shores. We'll be bringing you the unveil of the 2010 Ford Transit Connect live from the floor of the 2009 Chicago Auto Show, but until then check out the complete details below. DEARBORN, Mich., Feb. 9, 2009 – Ford is tapping its global portfolio of products to meet the unique needs of American small business owners with the 2010 Transit Connect, a spacious new fuel-efficient alternative to larger commercial vehicles that's ideal for navigating U.S. cities. "Transit Connect is a tangible success of our ‘One Ford' strategy to harness the best of our global products and offer new choices and solutions to customers in other parts of the world," said Mark Fields, Ford's president of The Americas. "With 40 percent market share, Ford is the reigning Commercial Truck leader in the United States, and we're looking for Transit Connect to further grow our leadership and allow even more customers to experience the ‘Built Ford Tough' difference." The 2010 Ford Transit Connect will be unveiled at the 2009 Chicago Auto Show. It arrives with a global reputation for durability and toughness dating back to its 2003 launch, when an expert jury of European commercial vehicle journalists named it International Van of the Year. Ford Transit Connect is built on a dedicated front-wheel drive commercial vehicle platform to meet and exceed the needs of small business owners and entrepreneurs. To prepare the Transit Connect for the unique needs of small businesses in the United States, the powertrain was upgraded to include a proven Duratec 2.0-liter dual-overhead cam (DOHC) four-cylinder engine and a four-speed automatic overdrive transaxle. Several design details, including the grille and interior touches, have been updated to lend the vehicle a fresh, new look for its American debut. "This workhorse is like nothing available today in the American market," said Derrick Kuzak, Ford's group vice president of Global Product Development. "We're offering small business owners a real choice to meet their needs, instead of asking them to pull seats out of minivans or compromise on one or more of their needs. Transit Connect is good news for small business owners nationwide." More than 600,000 Ford Transit Connects have been sold since 2003, to customers in 58 countries and on four continents. 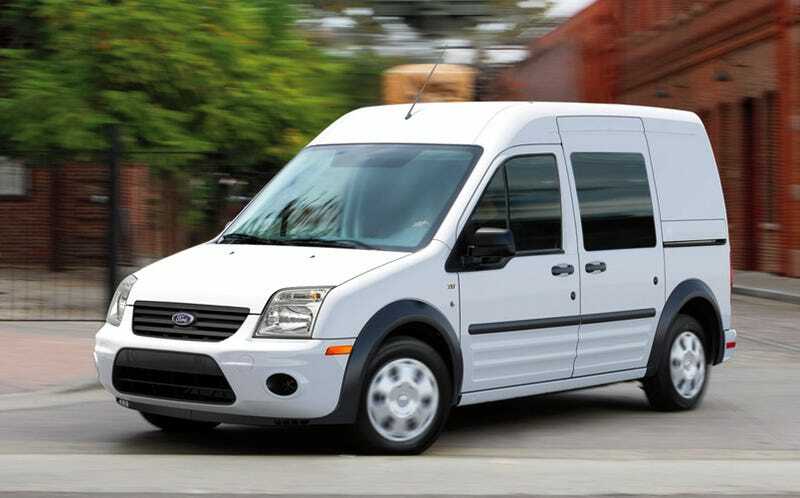 To fulfill the unmet needs of small business owners and entrepreneurs in the United States, Ford's Global Product Development team was able to quickly adapt the Transit Connect for the American market, validate its durability and tailor the cargo space for the unique yet diverse needs of small business proprietors. "Transit Connect was developed to bring small business owners a new vehicle choice, offering significantly improved fuel economy, generous and accessible cargo space with the agility and maneuverability to deliver the goods in tight quarters," said Rob Stevens, chief engineer. Transit Connect's capability begins with capacity. With 135 cubic feet of Transit Connect cargo volume, no other vehicle in the American market can deliver this combination of capacity and fuel economy. Transit Connect has more than double the cargo-carrying space of the Chevrolet HHR Panel, making it suitable for a broader range of commercial use applications. The Transit Connect offers commercial users a cargo payload of 1,600 pounds. This capacity means that the Transit Connect can carry a larger payload than the full size Dodge Ram 1500 standard-cab short-box pickup truck. "Transit Connect can swallow far more cargo than people might think," added Stevens. The Transit Connect's capability story goes beyond capacity. Its size and nimble driving dynamics provide agility for urban routes. Power-assisted rack and pinion steering allows a 39-foot curb-to-curb turning circle assures that Transit Connect is maneuverable when delivering the goods for entrepreneurs in tight quarters. The Transit Connect is expected to deliver at least 20 city and 24 highway mpg, pending EPA fuel economy certification. Ford Transit Connect was conceived, developed and engineered to meet the needs of small business proprietors all over the world. Once it arrives in the United States from the plant in Kocaeli, Turkey, Transit Connect can be outfitted for specific needs across a diverse range of users. Bulkheads, racks, bins and other upfits can be mixed, matched and configured to suit many specific commercial applications and needs. Transit Connect is offered with a wide range of upfitted cargo management options, similar to the enduring, market-leading Ford E-Series commercial vehicles. Small business owners have tremendous choice, with this unrivaled commercial application. The Ford Work Solutions in-dash computer allows small business owners to run their enterprises from inside the Transit Connect. Applications include downloading customer or product information, remotely accessing an office work station computer, sending and receiving text messages, navigating job or delivery locations with the Garmin navigation function and connecting with customers via hands-free phone functionality. The in-dash computer enables the availability of Tool Link, by DeWalt™. Using Radio Frequency Identification (RFID) tags that adhere to the tools or objects themselves, Tool Link allows the Transit Connect Cargo to be scanned for the appropriate tools and inventory items, prior to leaving for the jobsite or route. Tool Link helps manage valuable tools and ensures that specific items are on-board and available for use. Tool Link helps to keep all RFID-tagged objects on board, so at the end of the day, these items are secure and available for work on the next job. This system, not available in conjunction with the in-dash computer, provides a fleet manager with constant access to vehicle location information, the ability to track vehicle performance, automatic notification of vehicle maintenance needs and the ability to let drivers drive ─ not fill out written vehicle logs. Crew Chief allows online access to vehicle location, speed, idle time, fuel usage and more than 30 diagnostic measures. Functions and reporting can be tailored to meet the specific needs of fleets large or small. Crew Chief has "geo-fencing" capability, allowing a fleet manager to set geographic or time of use boundaries. Transit Connect is adaptable to multiple drivers, too. It features a six-way manually adjustable reclining driver's seat with an armrest, and a four-way adjustable reclining passenger's seat. The steering wheel tilts and telescopes to fit drivers of diverse sizes. Ford Transit Connect has a global track record of durability. It's a purpose-built commercial vehicle, built on a dedicated commercial vehicle platform in an exclusively commercial vehicle production facility. Transit Connect is designed, engineered and manufactured by Ford of Europe to beat tough, light commercial vehicle durability standards. The Transit Connect is powered by a well-proven Duratec 2.0-liter DOHC four-cylinder engine, featuring four valves per cylinder and an aluminum block and head. Sequential multiport electronic fuel injection provides precise fuel metering for smooth and economical performance. This engine, delivering an estimated 136 horsepower at 6,300 rpm and 128 ft.-lbs. of torque at 4,750 rpm, has proven American market durability. This engine is mated to a four-speed automatic transaxle with overdrive for additional fuel economy. A final-drive ratio of 4.20 to 1 is designed to give Transit Connect pulling power for the long haul. Fifteen inch steel wheels with P205/65R-15 black sidewall tires put the Transit Connect in contact with the road. The Transit Connect was developed at the outset to be durable, with a boron steel front crossmember, a high-strength steel reinforced body shell, twin- side cross members and side-impact protection. Several areas of the body structure are double-skinned for additional strength, increasing resistance to the minor scrapes inherent to urban delivery situations. Swage lines along the lower side door panels add rigidity and visual character. As a nimble, purpose-built commercial vehicle, Transit Connect can be a smart choice for the small business proprietor currently over-taxing the capabilities of an aging minivan with the passenger seats removed. While providing an ideal palette for identification and logo of a business on its body side, Transit Connect tells the world that its owner or operator has made a smart, savvy and efficient choice. Transit Connect keeps passengers and cargo safe and secure, too. Front and side air bags help keep driver and first-row passenger safe. Four-wheel anti-lock brakes and a Tire Pressure Monitoring System (TPMS) are standard, as well. A locking exterior hood release helps keep things secure up front. Lock-in-Latch shielded door locks help Transit Connect resist break-in. Transit Connect helps small business professionals keep their cool with standard air-conditioning and an AM/FM Stereo receiver with two speakers. A similar audio unit is offered, adding a single disc CD player and an audio input jack. A standard center console includes two large cupholders and twin storage bins for receipts, invoices and toll coins. The Transit Connect roofline allows an overhead storage shelf, holding the small items an entrepreneur needs to keep top-of-mind. With models starting at $21,475, including destination, Transit Connect is accessible to a wide range of American small business owners. Plus, low operating costs, excellent fuel economy and 7,500 mile service intervals make economic sense, for businesses on tight budgets. A comfortable ride, an automatic transaxle and small exterior dimensions make Transit Connect accessible to lots of drivers that might be intimidated by the prospect of a full-size commercial vehicle. "Transit Connect will be a useful small business tool," said Chief Engineer Stevens. "It drives like a car, works like a van and is engineered to be as tough as a truck."